Over the past year, we have enjoyed our short visits to U.S. cities. Chicago was an architectural delight. New York for the holiday season got us ready for Christmas. And Washington for cherry blossoms brought us spring cheer when Toronto was still cold and grey. 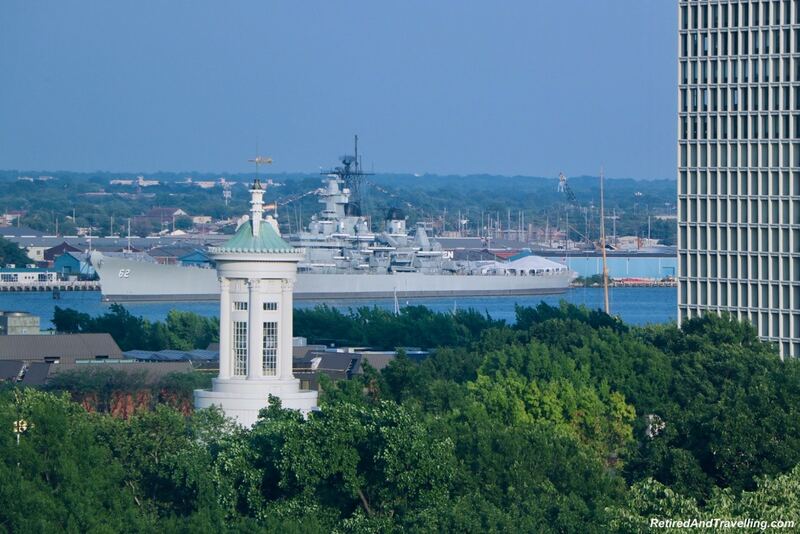 We checked out options to head south for the 4th of July holiday. Philadelphia won the draw for this year. 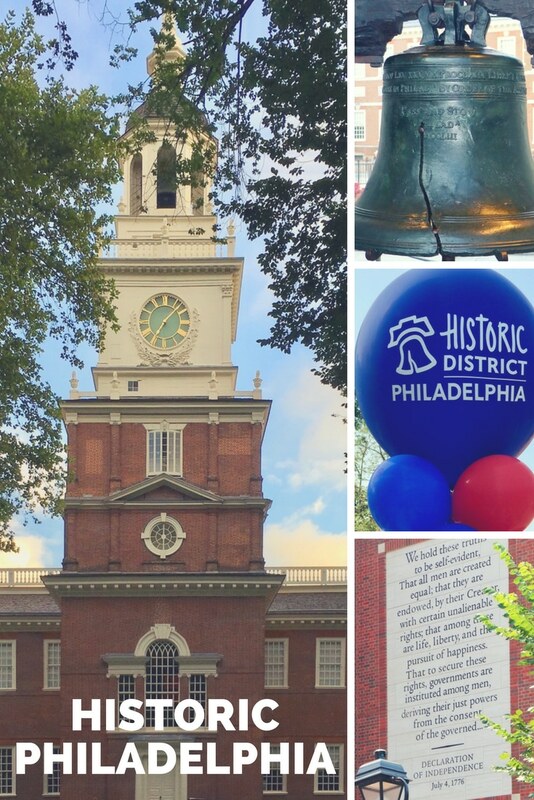 While we went primarily to enjoy the July 4th holiday celebrations, we found lots of things to do in Philadelphia! Of course, before we set out, we did our usual thing of gathering up important information for emergency services in the area. You never know when it might pay off to have a philadelphia personal injury lawyer on speed dial. It always pays to be prepared. It has been years since either of us visited Philadelphia. We stayed right in the historic district and loved the opportunity to explore the architecture and history of the city. Of course we found lots of great food! 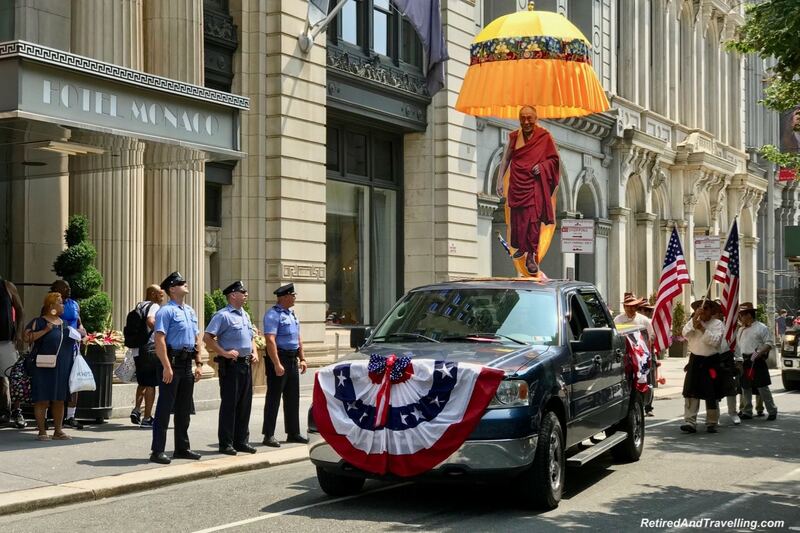 And the Independence Day celebrations in Philadelphia capped off our visit. 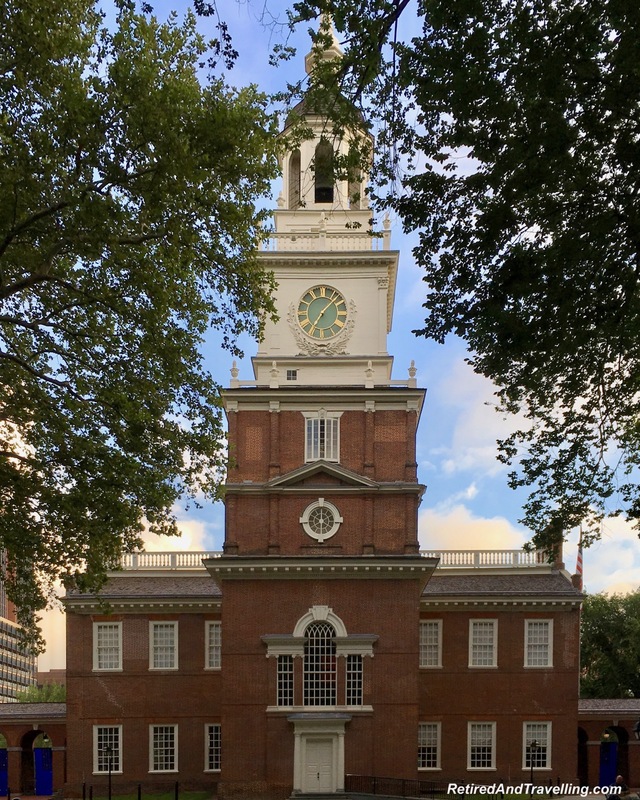 Some of the things to do in Philadelphia on a quick city visit …. Philadelphia is about 8 hours if you drive straight from Toronto. On our trip down, we stopped for one night in the Finger Lakes region. Who could miss the chance to stay in Geneva! 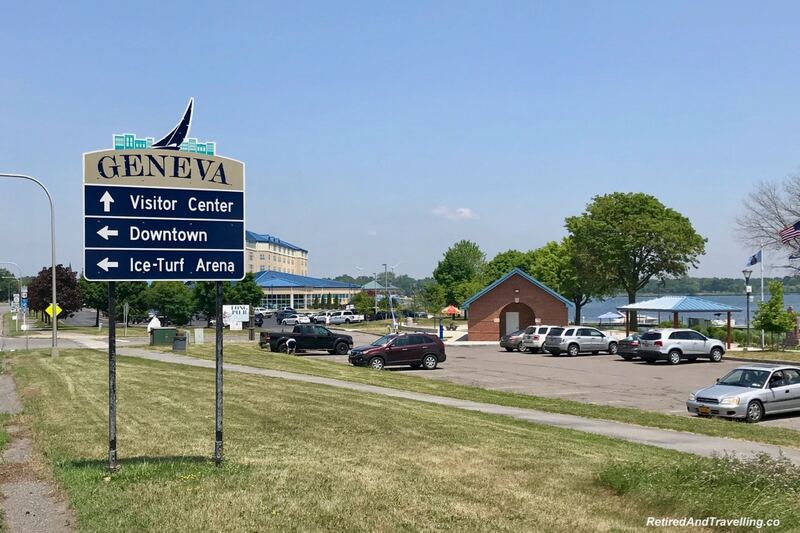 We looked out over the lake and knew we were not in Geneva, Switzerland. There were no snow capped mountains in the distance as we had seen on our other visit to Geneva. When we left Geneva, we wanted to make one stop on our travel day. 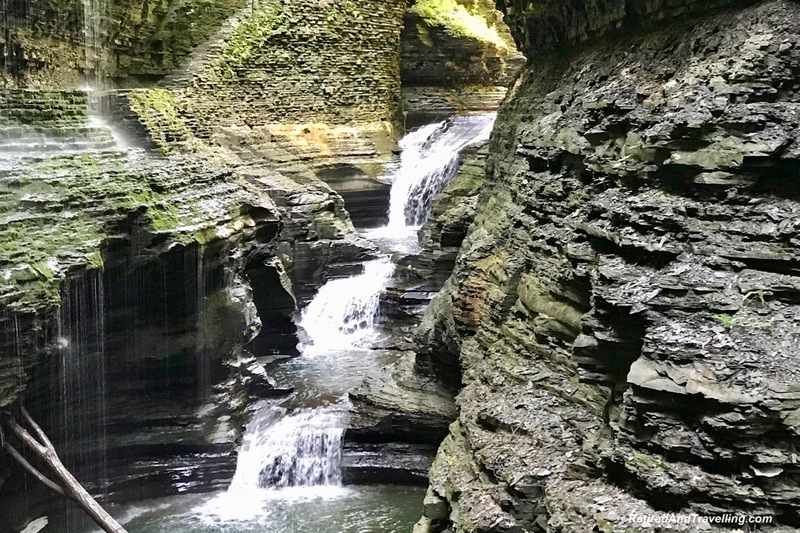 We picked the waterfalls at the Watkins Glen Gorge. It was such a great choice. The north east was under a heat wave. 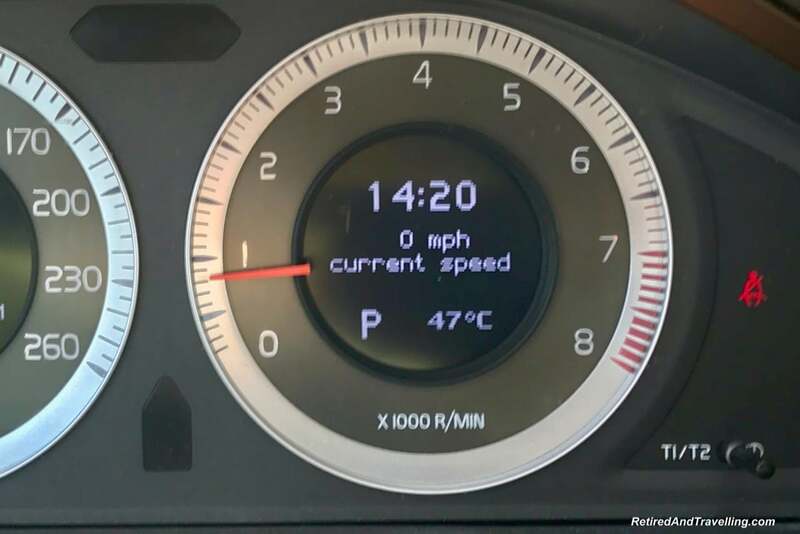 The temperature in our parked car reached 47? (117?). And the walk along and through the waterfalls was a great way to cool down. On our trip home from Philadelphia we followed a different route. 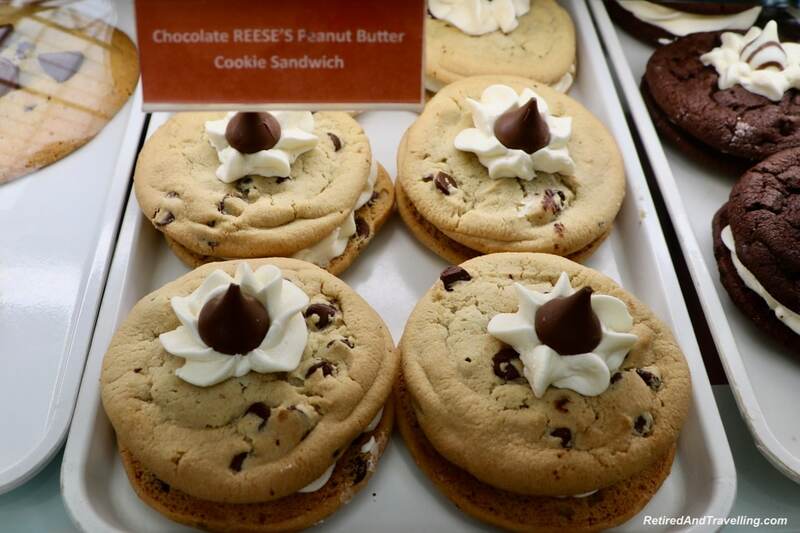 Who could miss out on a stop in Hershey, PA when it was so close. There is lots to do in Hershey but we only wanted to find chocolate. 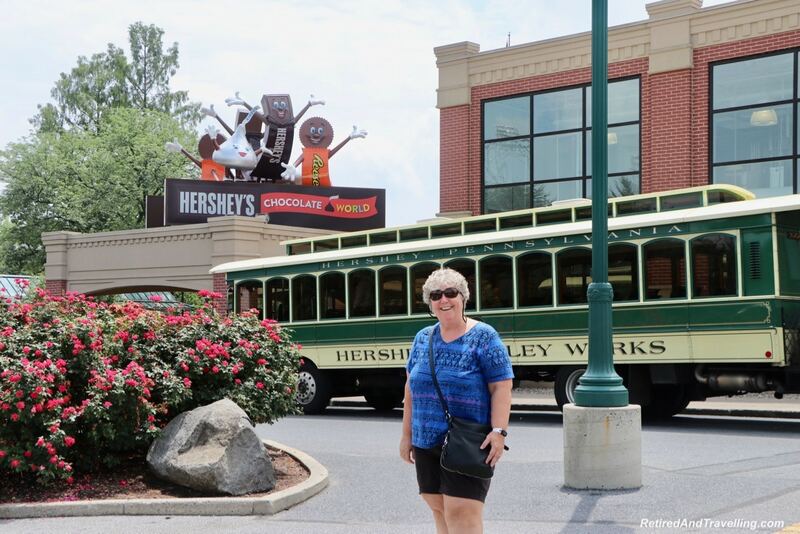 Hershey Chocolate World was a fun and delicious spot to visit. Don’t ask how much chocolate we walked out with! There were lots of things to do in Philadelphia once we arrived. But we chose not to drive straight through. And we enjoyed our stops along the way. We wanted a hotel that would be close to the festivities. 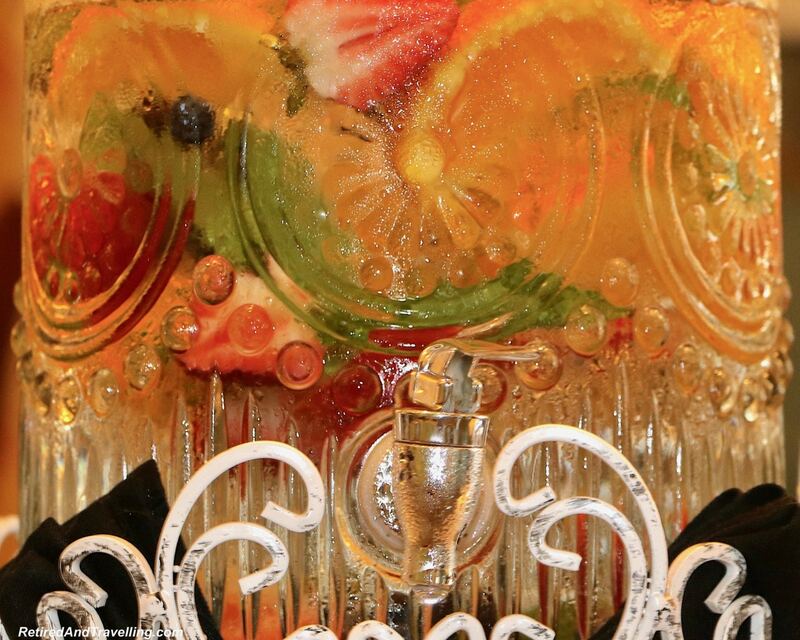 The Kimpton Monaco Hotel was a luxury oasis right in the heart of the fun. We are still working on our reward points collection for this year. 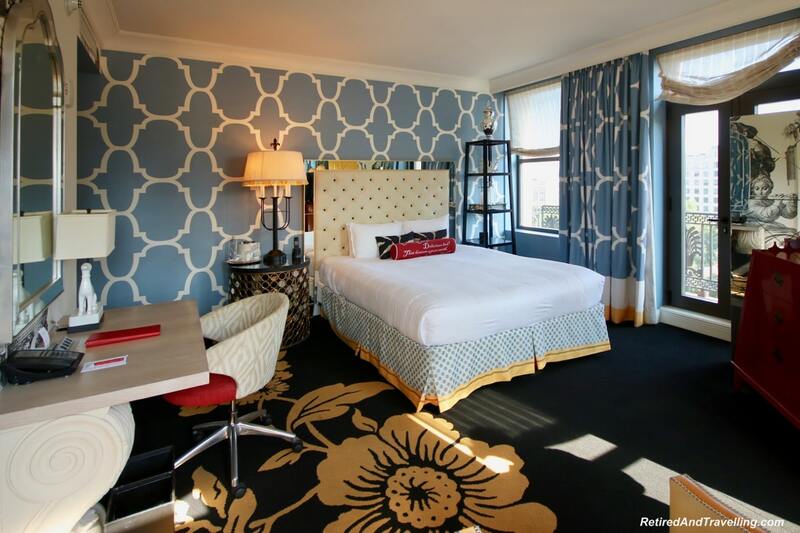 A Kimpton stay helped us to maintain our Spire rewards level with IHG Rewards. The hotel is in a historic building. We got the greatest corner room upgrade with views over Independence Square and down to the water. 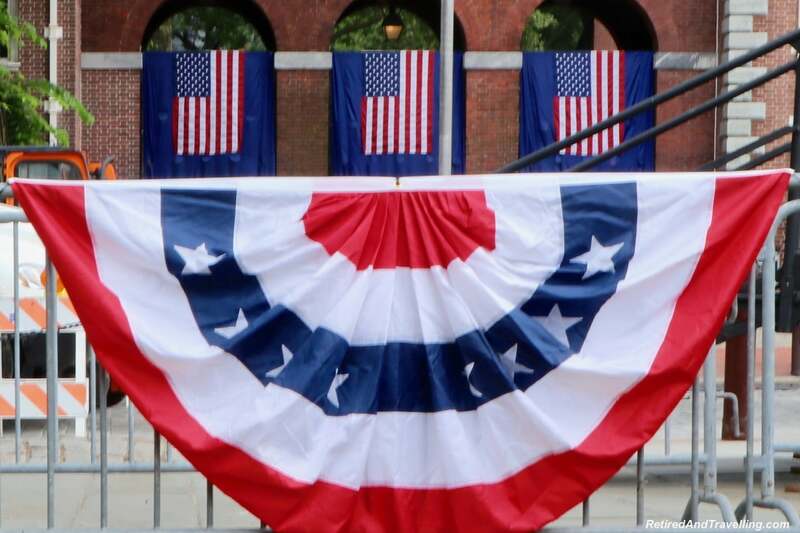 We could watch some of the July 4th festivities set up from our window! The hotel decor was fascinating. Different themes were used in various parts of the hotel. Our suite was decorated in an “Alice in Wonderland” theme. 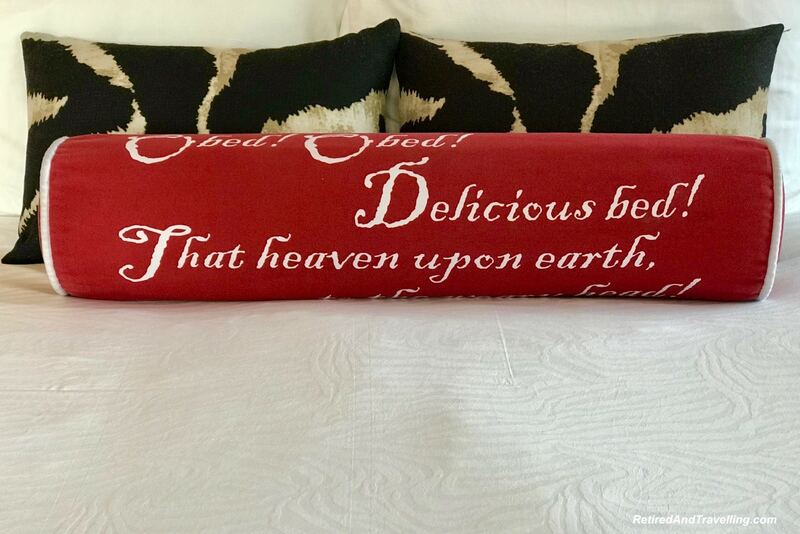 The bed was soft and welcoming! The bath was great after we walked all day. A perfect spot to relax between walks out in the heat. We loved the morning coffee in the lobby. And the fresh fruit water kept us hydrated though the day. But our favourite part of the Kimpton Monaco experience was the wine happy hour at the end of the day. It was a great chance to have a glass of wine and talk to others who were visiting. 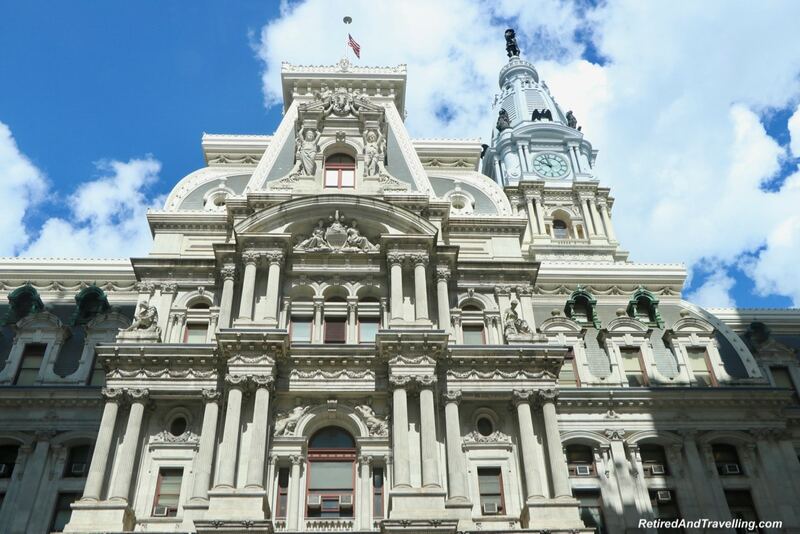 We got great tips on things to do in Philadelphia! We loved having a luxury spot to enjoy our visit to Philadelphia. Being so close to the fun meant we could pop back in regularly to enjoy our great room and the hotel amenities. No trip is complete if we don’t take the chance to enjoy the local food. We often book breakfast at a hotel so we don’t start our day deciding where we will eat. 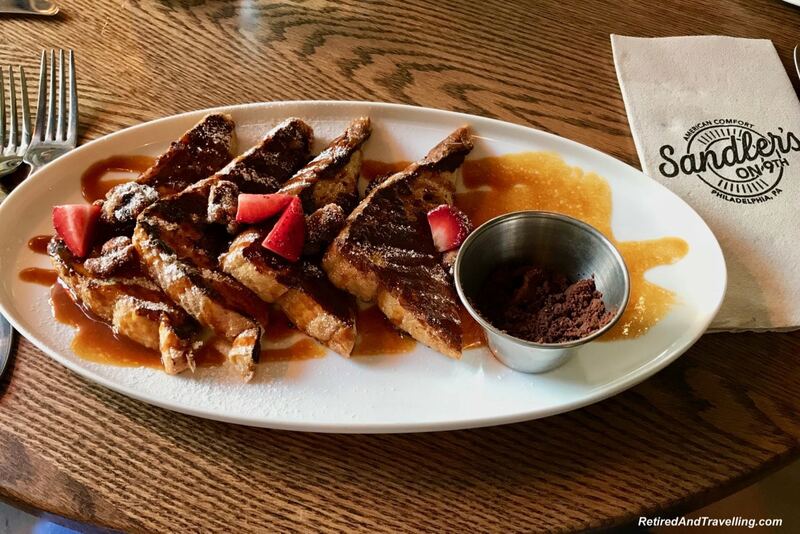 For this trip, we did not book breakfast and we never had to worry about finding the perfect start to the day. My low carb diet though did get thrown out the window most days. We had the best french toast at a new spot (Sandlers on 9th) and then topped that experience at Luna Cafe. 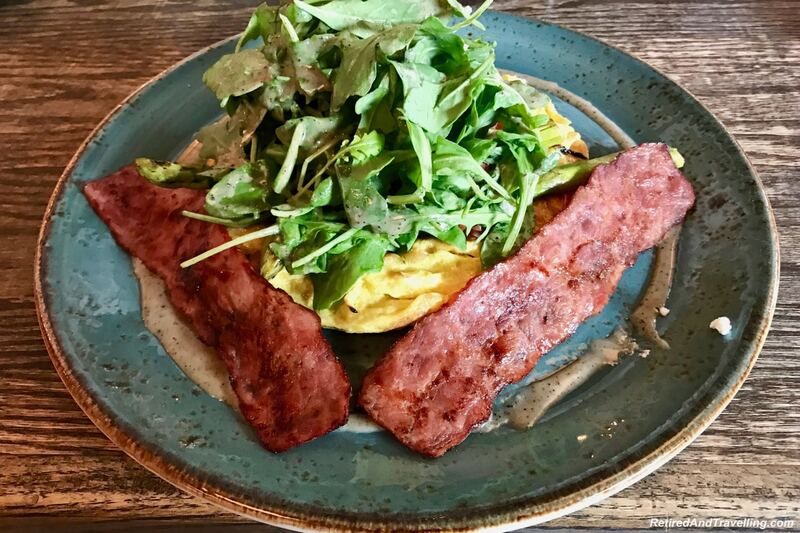 The Red Owl Tavern at the Kimpton Monaco offered a tasty but healthy option for great gourmet omelettes. The truffle drizzle was a great addition! 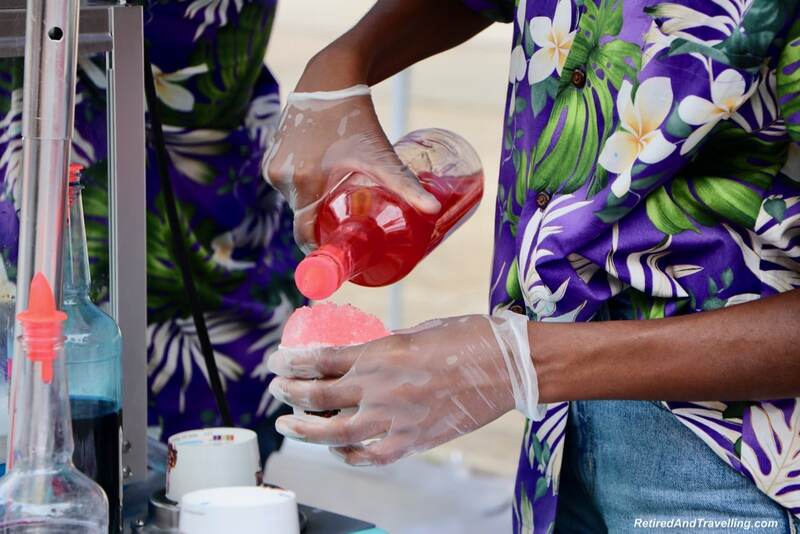 The July 4th celebrations brought dozens of food trucks into the Independence Square area. 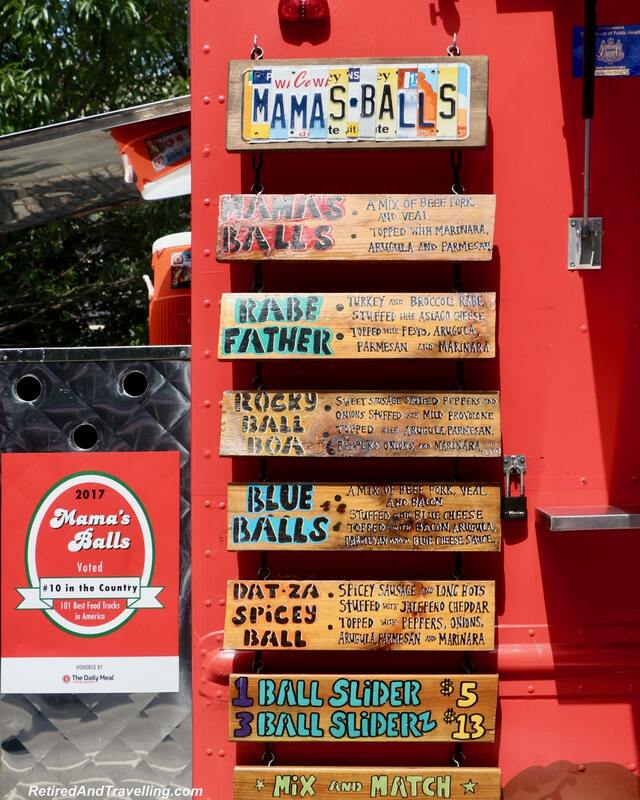 We loved the great variety and delicious food we found in the food trucks. We started off healthy with lobster rolls. But must admit we sampled far too many other things off our diet. It was easy to find food a short walk from our hotel. We could not leave Philadelphia without having a genuine Philly cheesesteak. I have ordered them in other places, but they never taste as good as the real Philly ones. We had lots of choice but Sonny’s called to us. I passed on the cheese whiz version but made sure to add lots of fried onions and sweet peppers. So yummy! 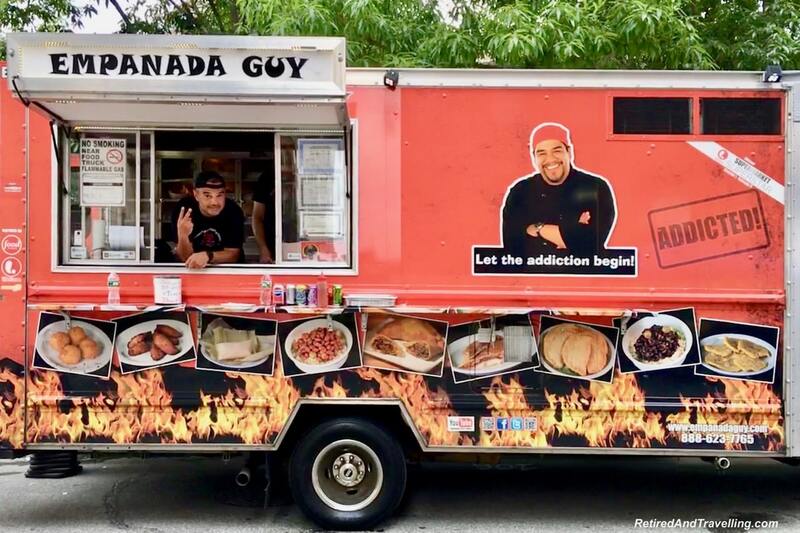 Eating is one of the great things to do in Philadelphia. I am sure there are more gourmet spots to dine. But we loved our simple fare. It was a good thing we walked a lot to burn off the extra calories! We were blown away when we visited Chicago and saw the variety of architecture in the city. We always are amazed at architecture when we head to Europe. Our recent visit to Prague showed us the most amazing art and architecture in the streets. 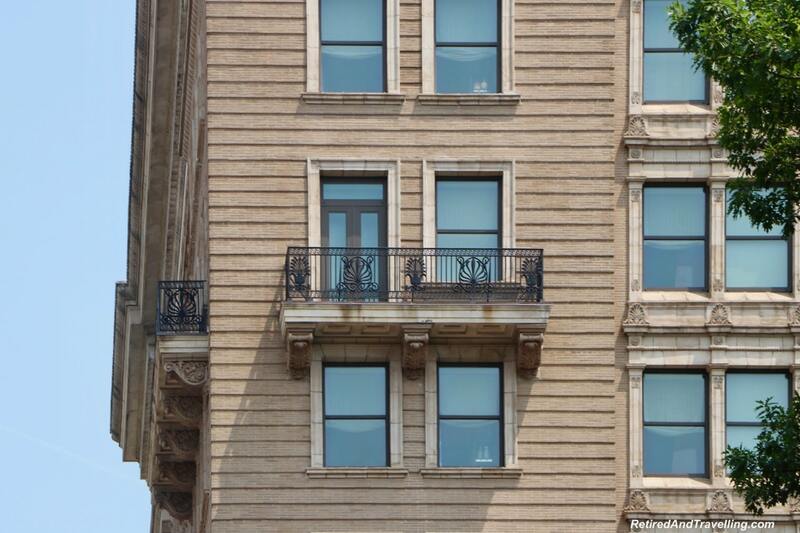 So it is not surprising that one of the things to do in Philadelphia would be to look at the buildings. 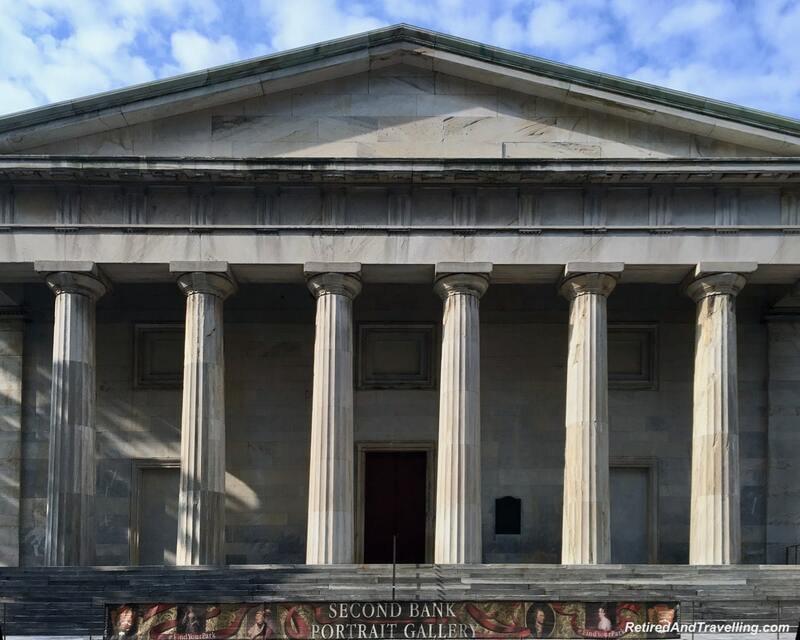 The old bank buildings were artistic and beautiful. 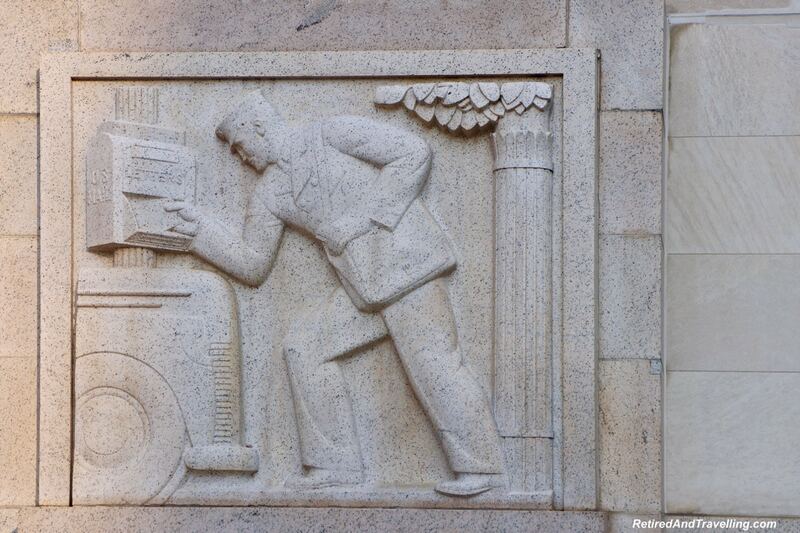 The post office displayed murals that showed mail being delivered in different settings. 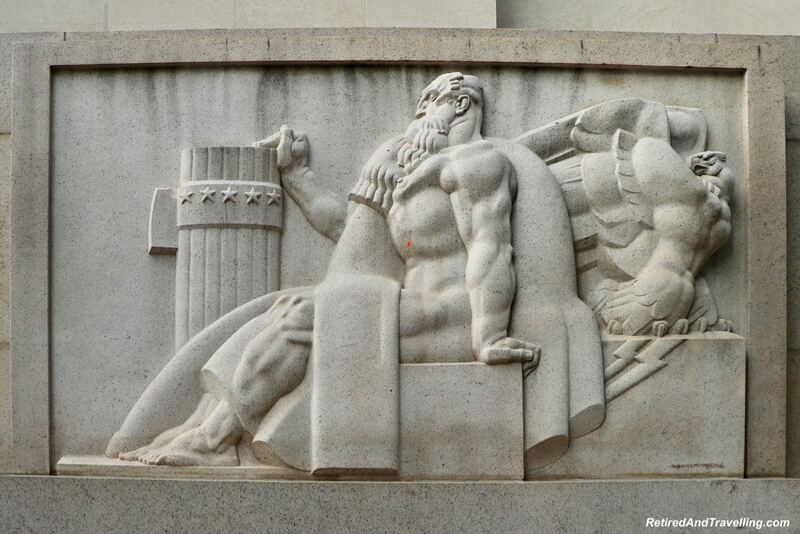 The court house drew our attention to the detail on the building relief pictures. 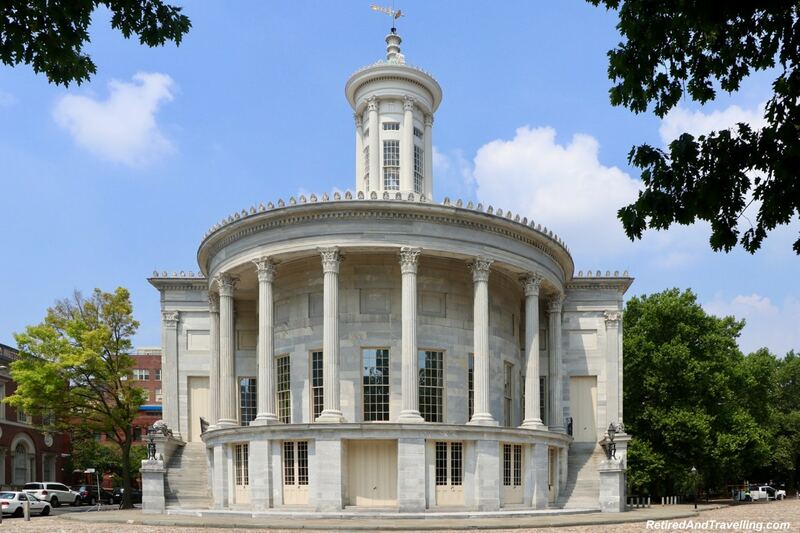 The Merchant’s Exchange building sat on a cobblestone street that reminded me of Europe. Perched on the corner was a sleeping lion. The Customs House was like a tiered cake. The statues adorning the City Hall kept us staring for hours! For an amazing inside view we stopped at the Franklin Residences. 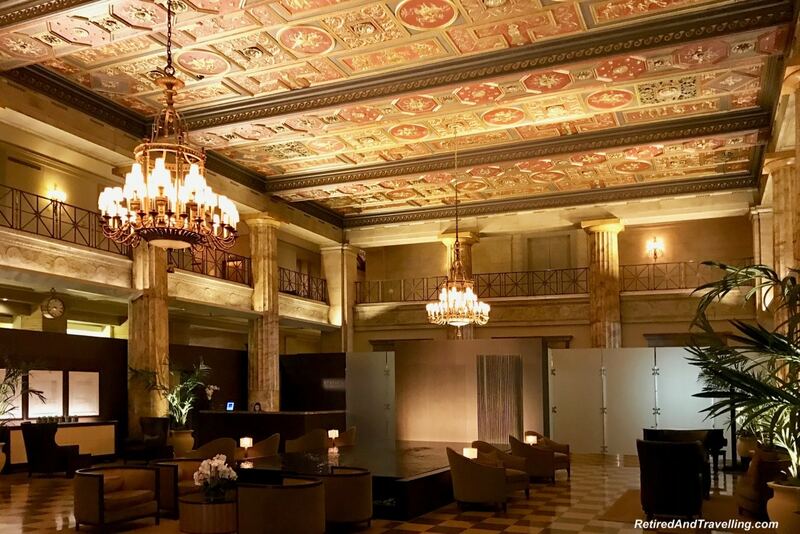 The interior of this former hotel showed the elegance of another era. The ceiling was the most beautiful sight to behold. Even the grates in the ceiling were works of art. For a building geek, spending time admiring the buildings is one of the great things to do in Philadelphia. We did not make it to any of the great museums or art galleries in Philadelphia. But we did get a chance to see some of the colourful street art. 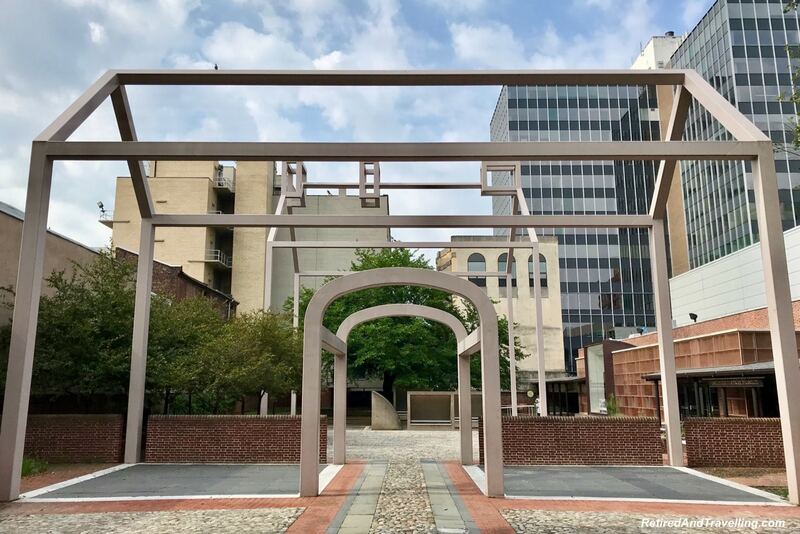 The city of Philadelphia promotes the city art. 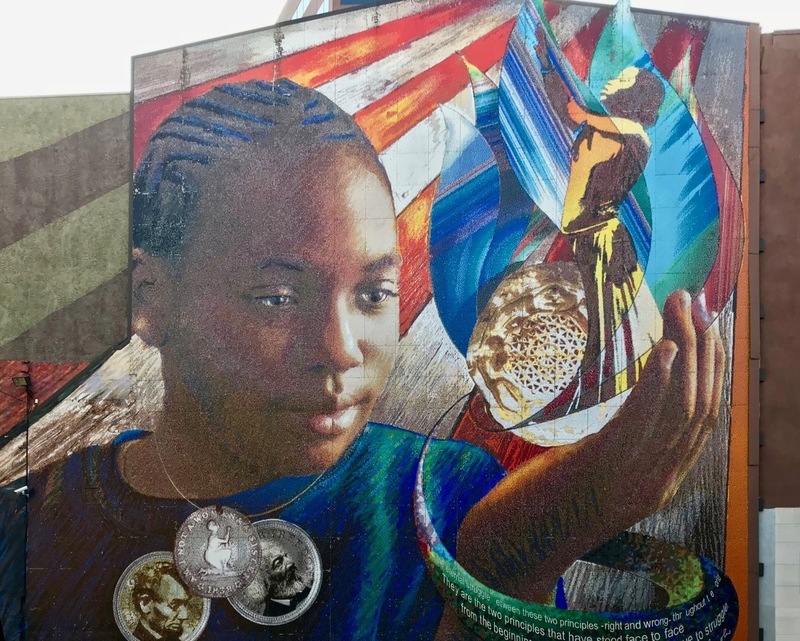 The Mural Mile contains a series of fascinating massive murals. 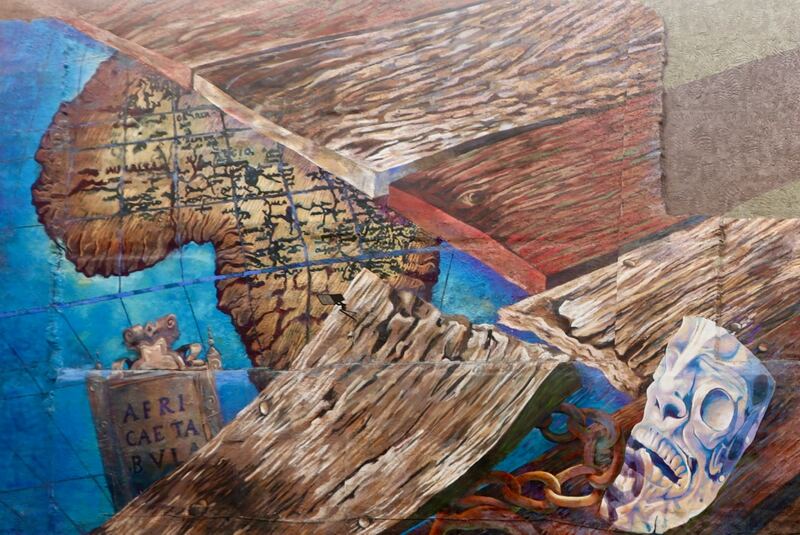 The city’s Mural Arts program extends to interesting canvases. 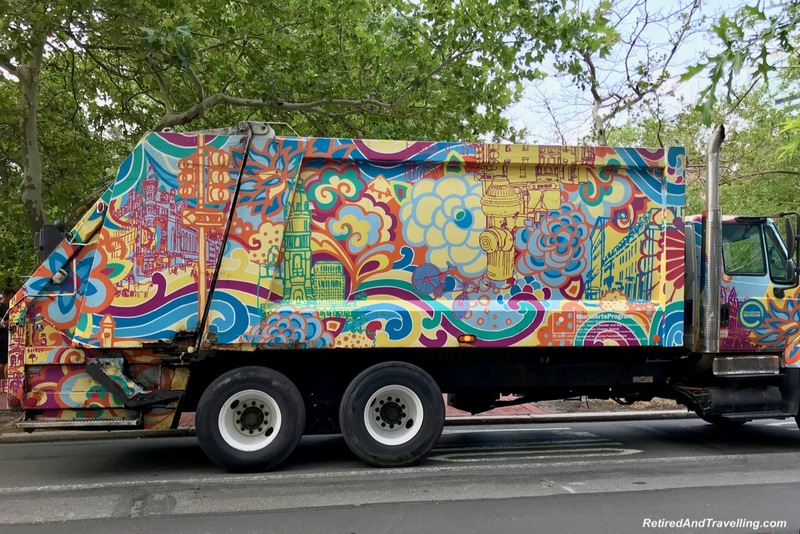 We were delighted with the colourful garbage trucks the we saw. But we also found lots of street art outside of Philadelphia as we travelled. It seemed that everywhere we looked in Williamsport, there was another piece of street art to see. 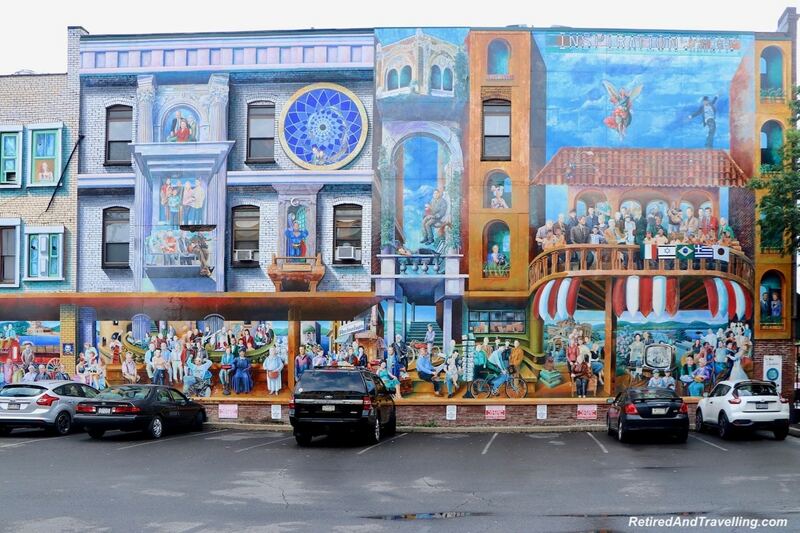 Finding art in the streets was one of our most interesting things to do in Philadelphia. 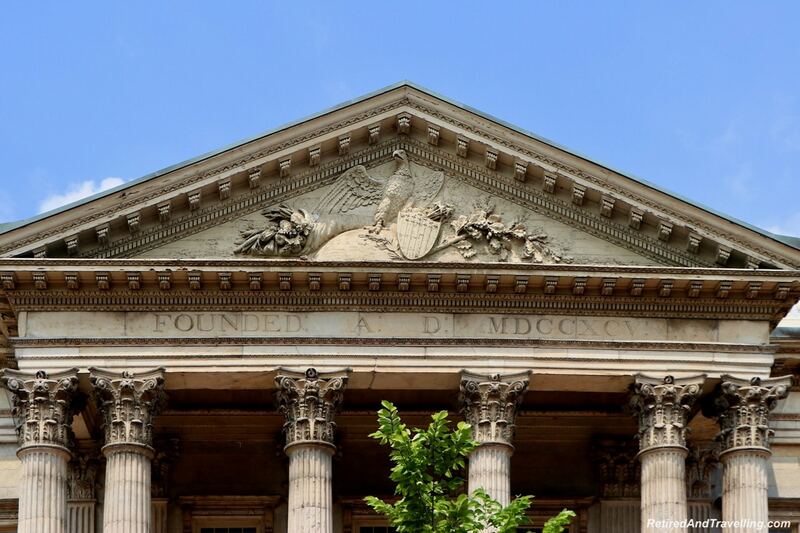 Philadelphia is a city filled with the history of the nation. Right beside our hotel was Independence Square. 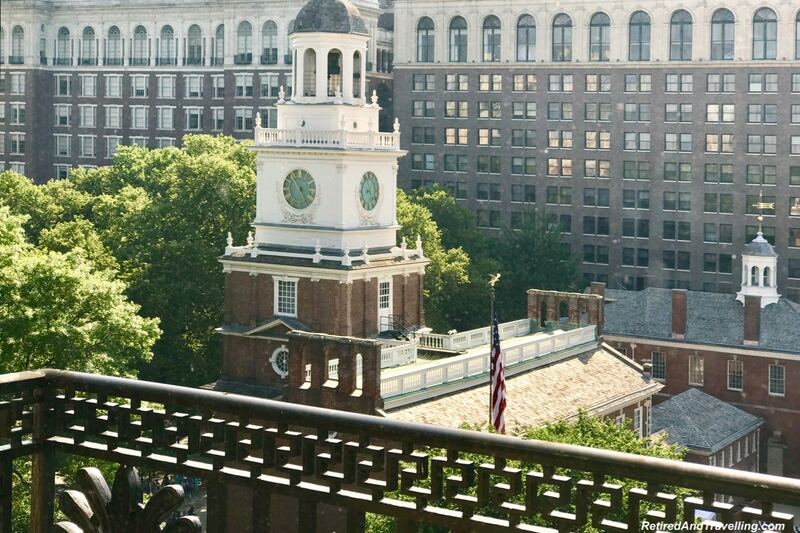 Independence Hall with its bell tower was the backdrop for the July 4th celebrations. The Liberty Bell now sits in the Independence Visitors Centre. 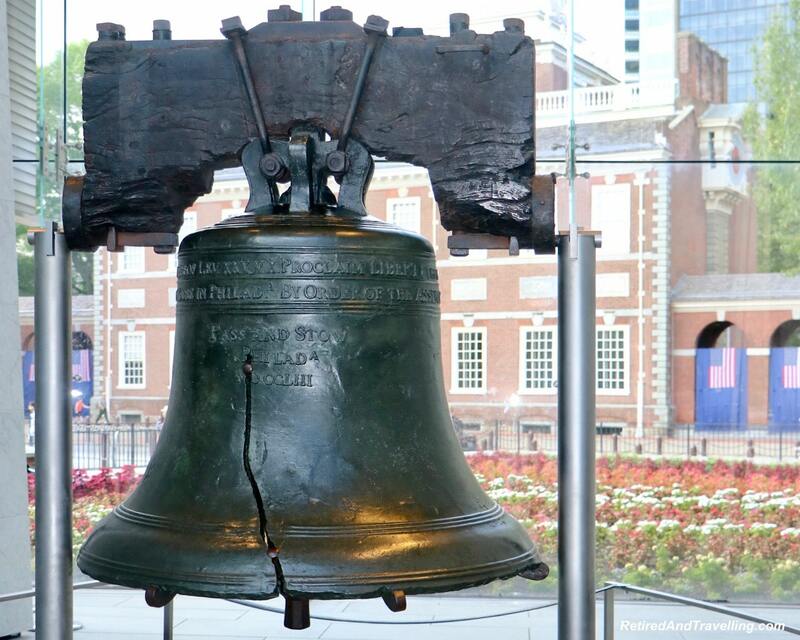 There were line ups all day to see the bell with its infamous crack. 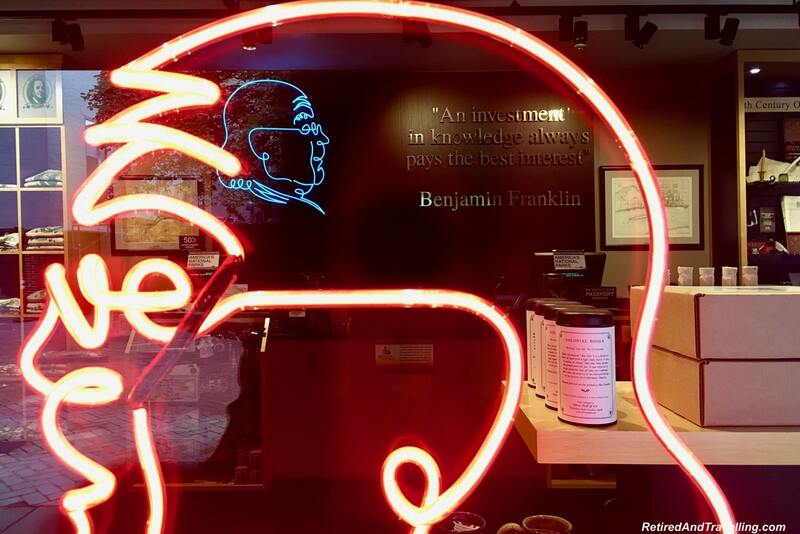 We found a whole block that celebrated Benjamin Franklin. We saw the Franklin Post Office and the archeological site of his former house with a building frame and plaques. There was a large museum to visit. And a story hour in the afternoon. 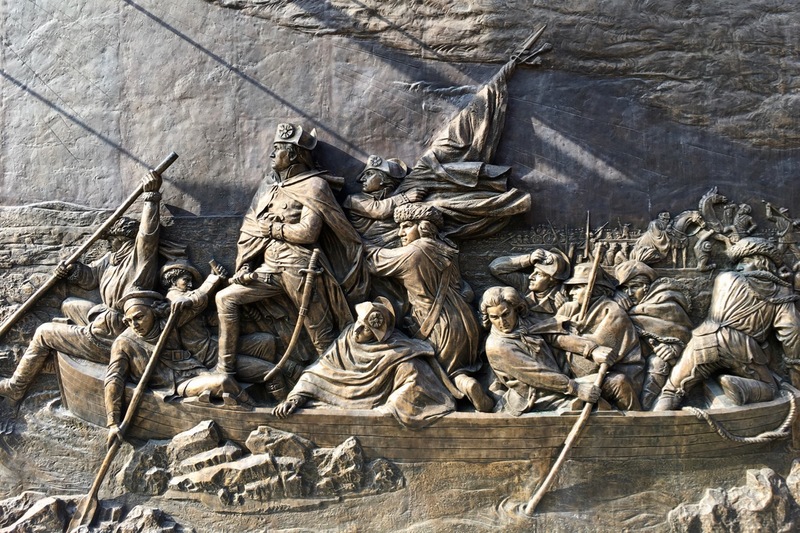 The outside of the Museum of the Revolution contained large relief walls that showed both Washington crossing the Delaware and the signing of the Declaration of Independence. 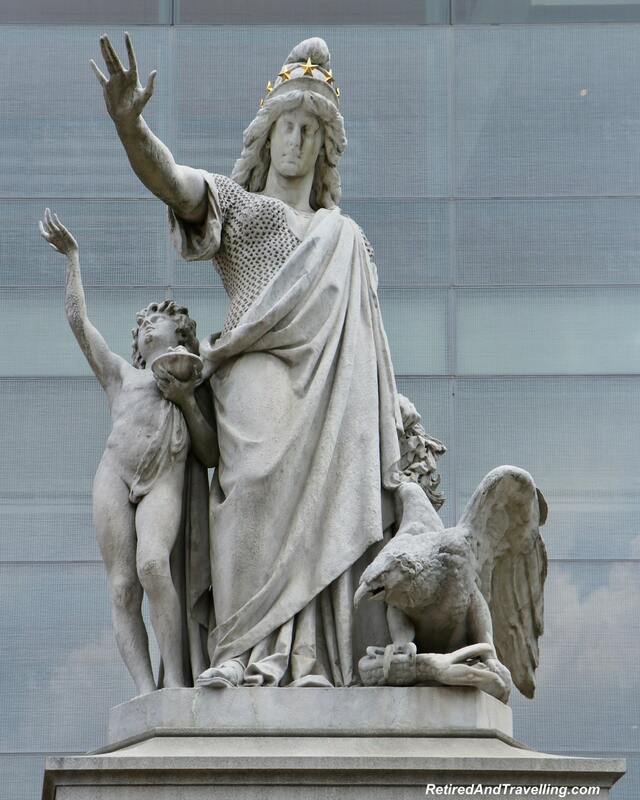 Statues around the city reminded you of the city’s history. There was one we liked that was dedicated to religious liberty. 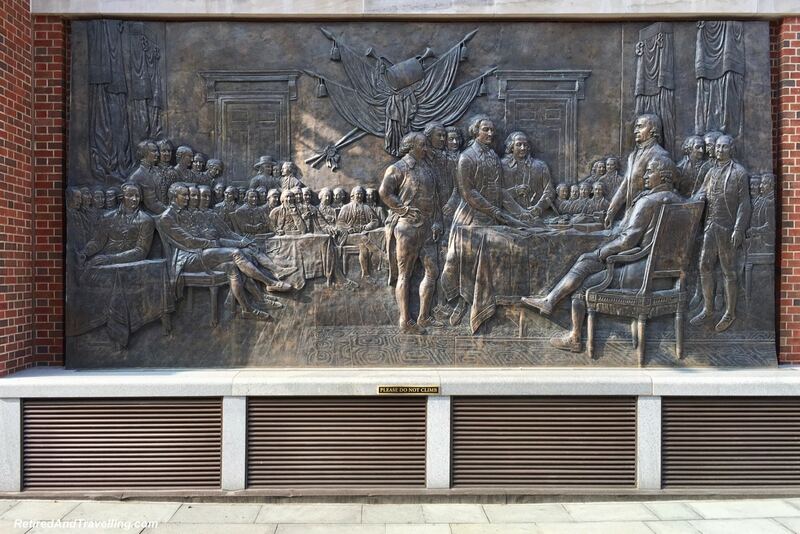 And another that celebrated the signing of the Declaration of Independence. 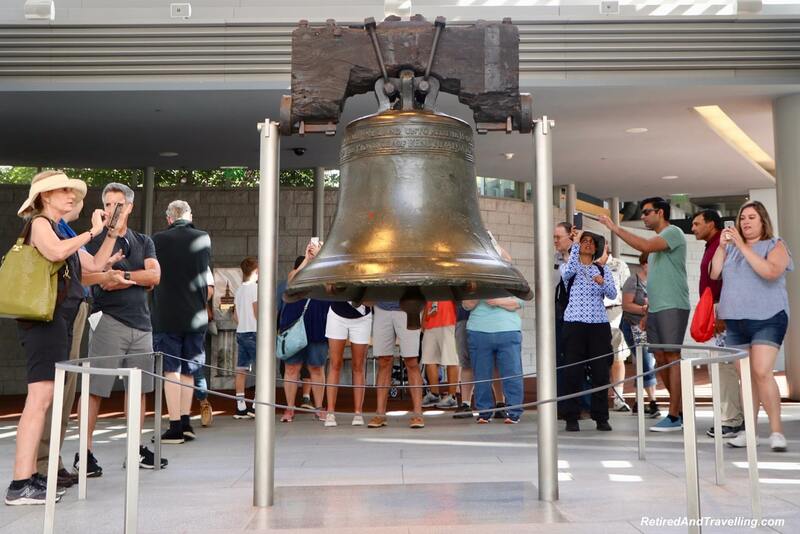 There were so many things to do in Philadelphia that showed off the history of America. 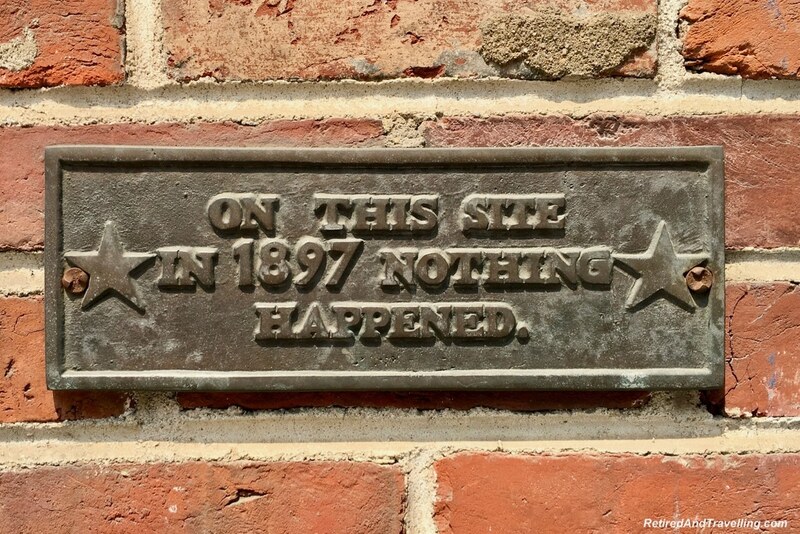 So we laughed when we saw the sign commemorating nothing! 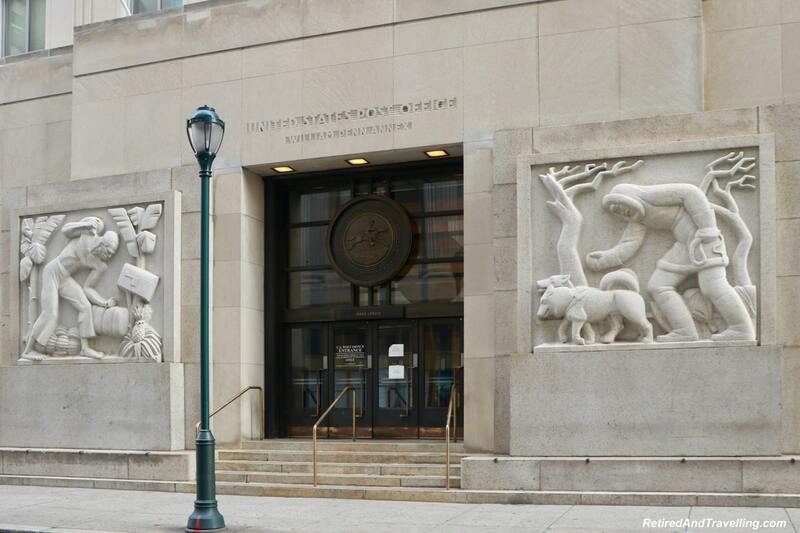 One of the most popular things to do in Philadelphia is to walk through the sites of American history. 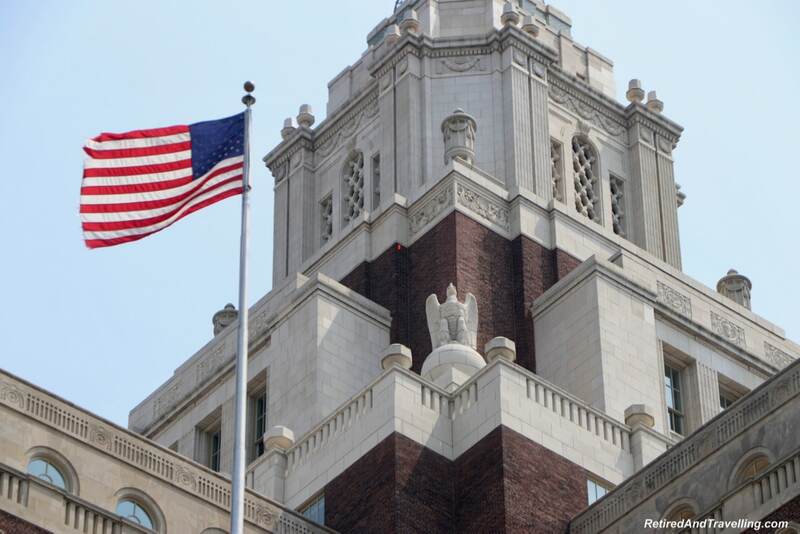 A city with the history of Philadelphia is the perfect spot to celebrate Independence Day. The 4th of July celebrations surrounded us. There were concerts on Independence Square. Food and trinket vendors were everywhere. The parade showcased bands, colourful city floats and every nationality. 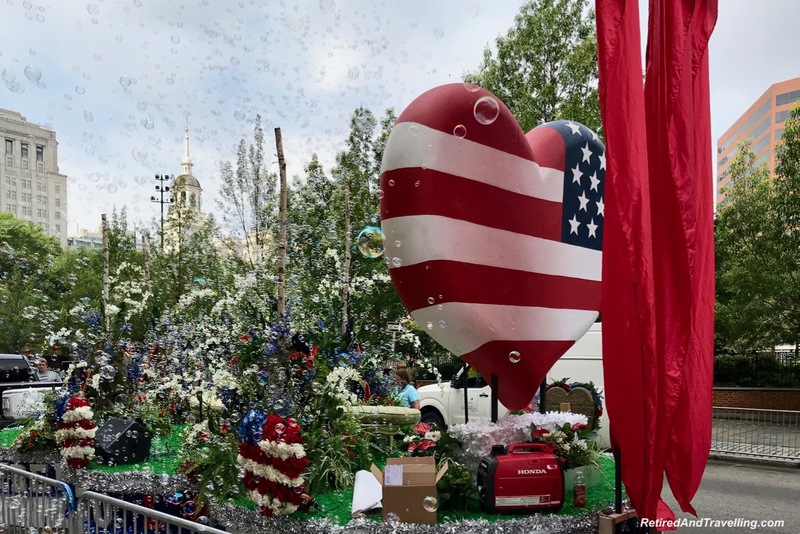 It was a great show of pride in America. And everyone had a blast! 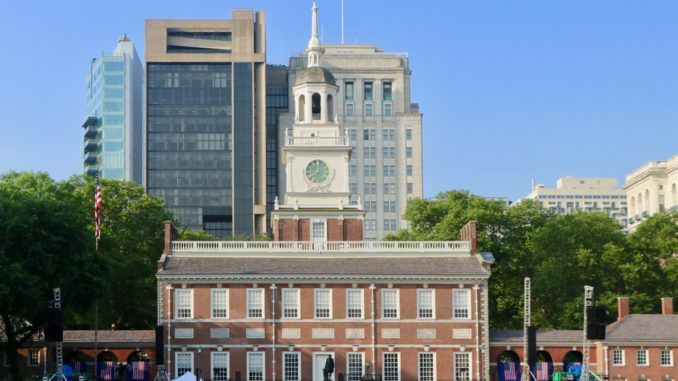 Visiting for July 4th holiday is one of the best things to do in Philadelphia. 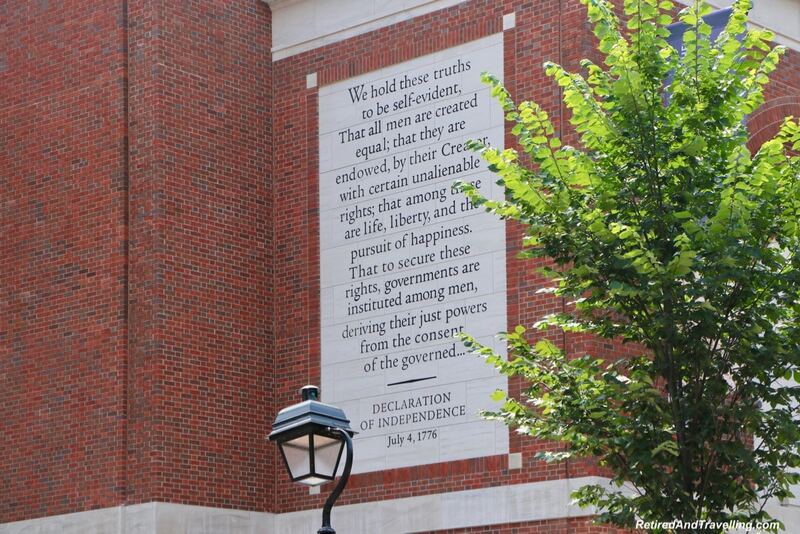 We went to Philadelphia to celebrate the July 4th Independence Day holiday. And we found so many other things to do in Philadelphia. But we only just scratched the surface when we visited “the most historic mile in America”. We definitely need a return trip to see so much more! It was great to take our time on this road trip. We discovered that the Finger Lakes were an easy trip from Toronto. 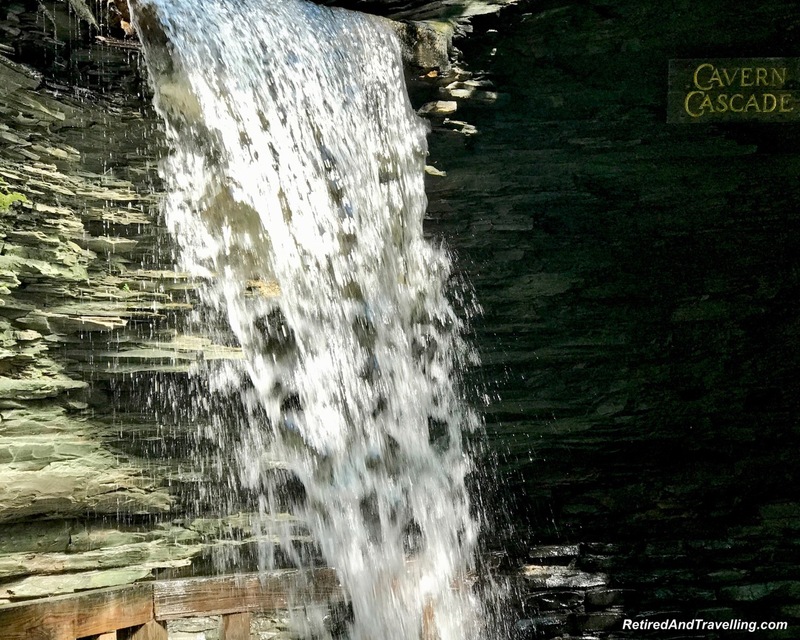 Our stop at the Watkins Glen Gorge was a great way to get out and enjoy nature. We will definitely head back down to northern New York State. A stop at Hershey Chocolate World was definitely worth the detour! 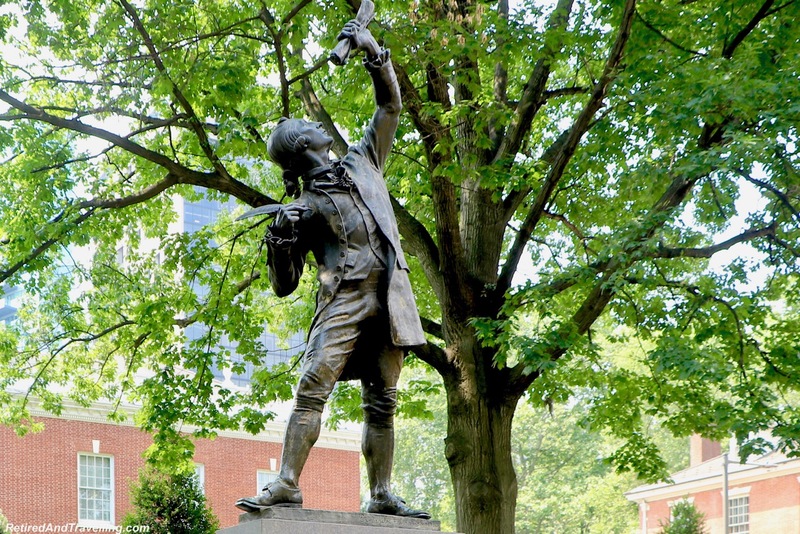 What was your favourite of the things to do in Philadelphia? What is on your list for your next trip? I haven’t been to Philadephia yet but it seems like a place I have to add to my bucket list. This is an exceptional guide which I’ll definitely use when being there! Great tips on what to do. Never really considered a visit here but I will be sure to add it to my list! Philadephia architecture is so regal and majestic! 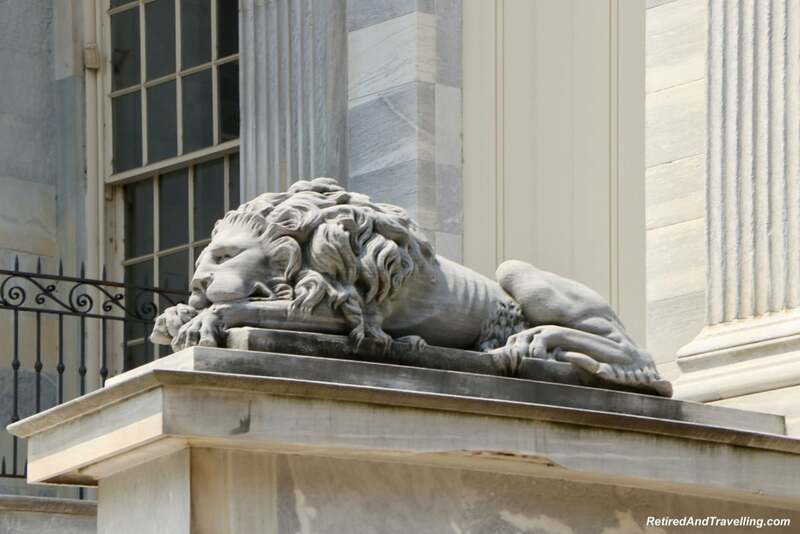 I love the photos of the finer details of the buildings like the lions and eagles. I can imagine how much the food there was a challenge for any diet. 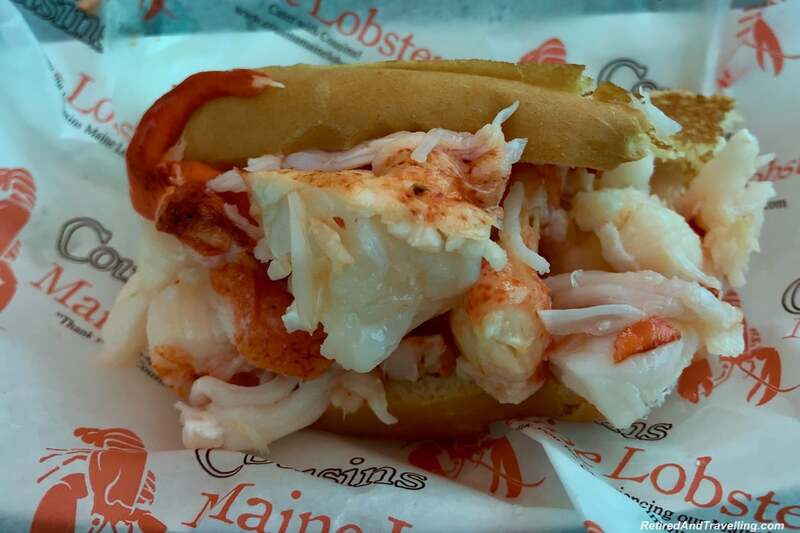 Those were huge hunks of lobster in that lobster roll. 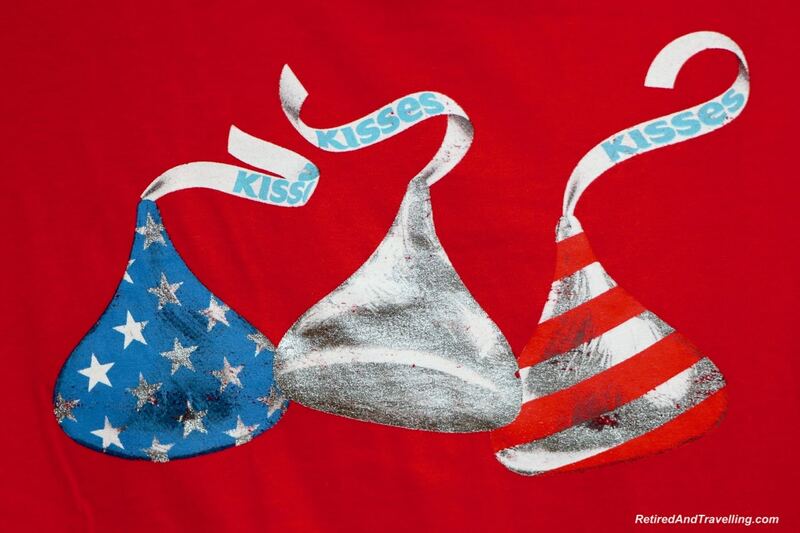 I can see why you stopped into the Hershey Chocolate factory – you had me at chocolate! I love the street art! And yeah, you can’t go to Philly and not have the cheese stakes. So funny that there’s a whole different ‘Geneva’ in Philly. The Franklin Residences look like an interesting place to visit. You’ve listed some great things to do in Philadelphia here, I’d refer back to this list if I were to ever visit. The only other thing we did in Philly you didn’t mention is Reading Terminal Market! And the only other choice besides Philly for July 4 celebrations is Boston or DC but they would be 2nd and 3rd choices! 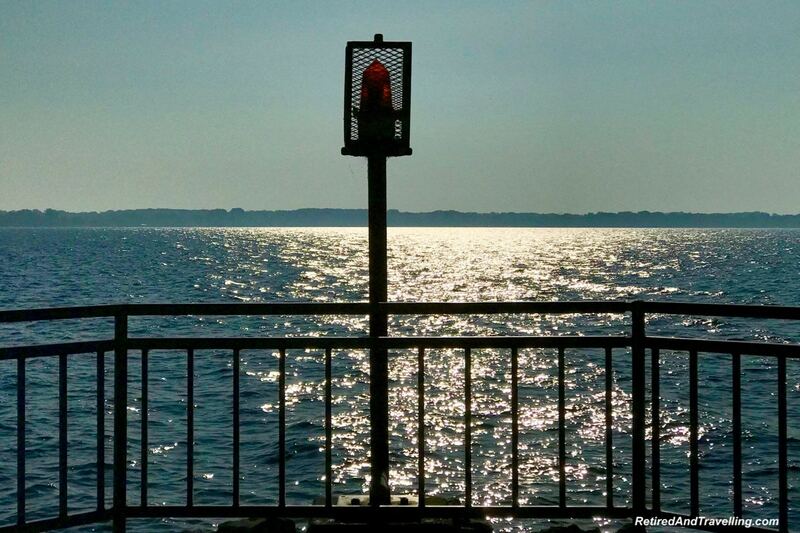 And your side trip to Finger Lakes sounds awesome. We went to Hershey too and added Pittsburgh! 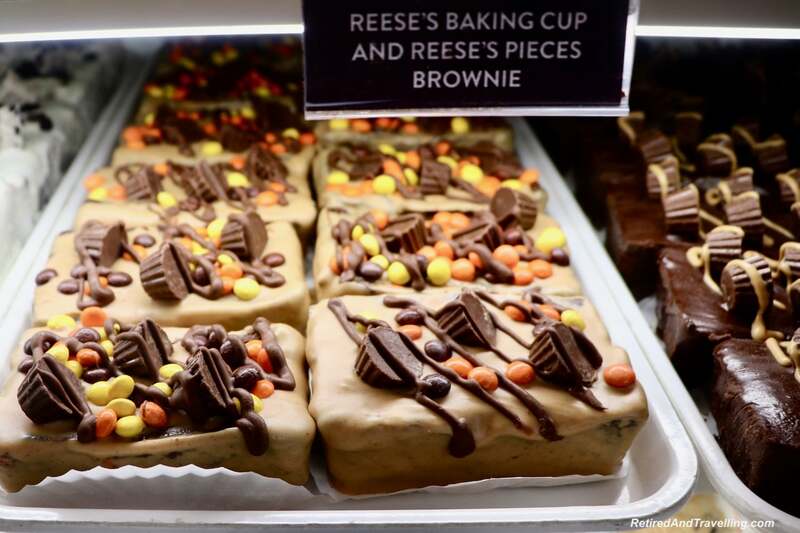 All seven activities/attractions sound just amazing – but my favorite would be Hersheys, although I’m normally rather into hearty food, but the Reeses baked in the pies…mmmm I can literally taste them on my tongue. 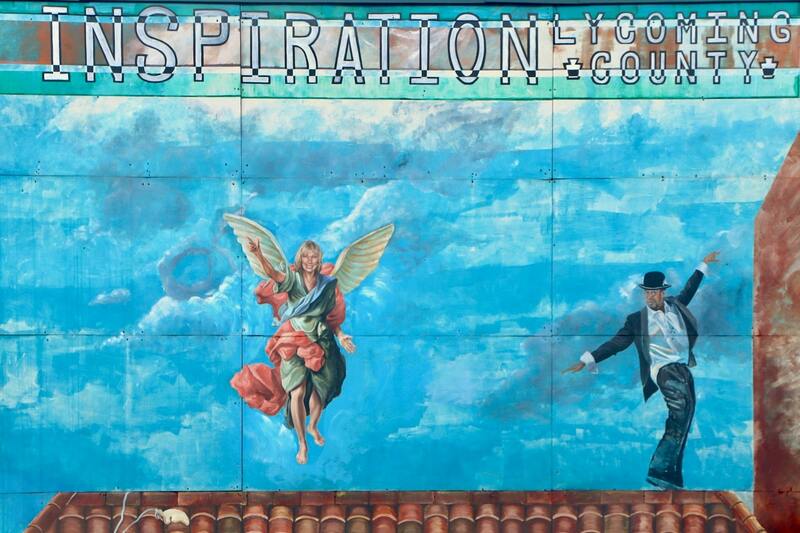 And the Street Art looks just great – would love to see it ‘in person’. 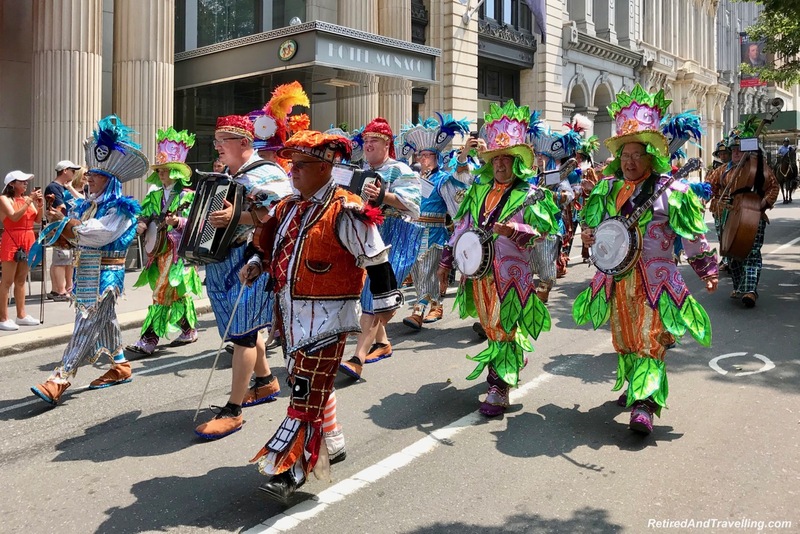 I haven’t been to Philadelphia, visiting for 4th of July and seeing the parade would be amazing. 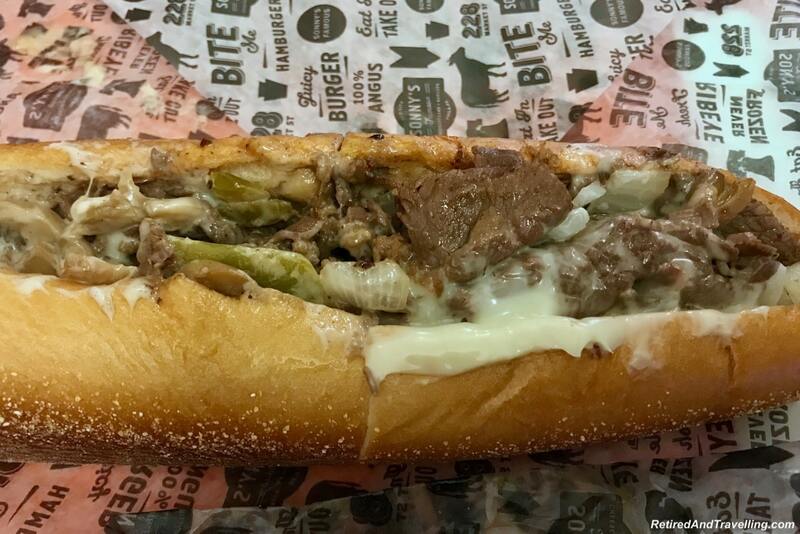 And that lobster roll looks so good, but so does the cheesesteak! 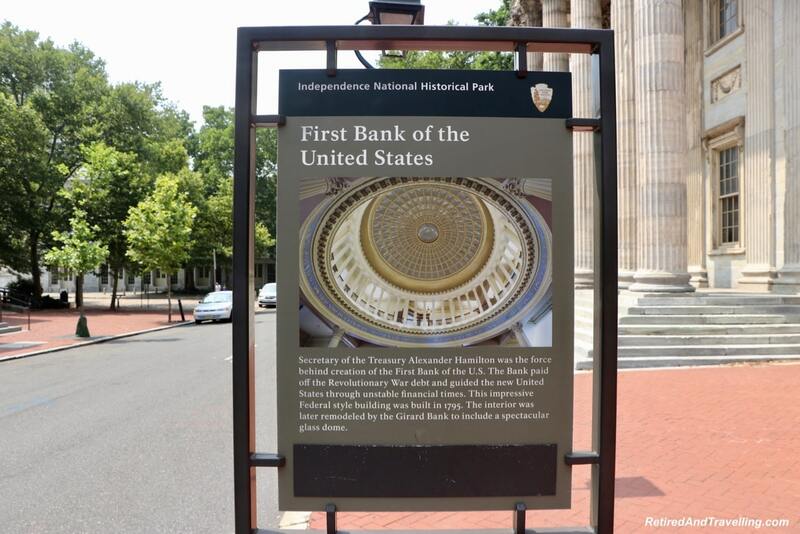 There is so much of history in Philadelphia which is fascinating. A visit around the 4th of July seems to be really special. 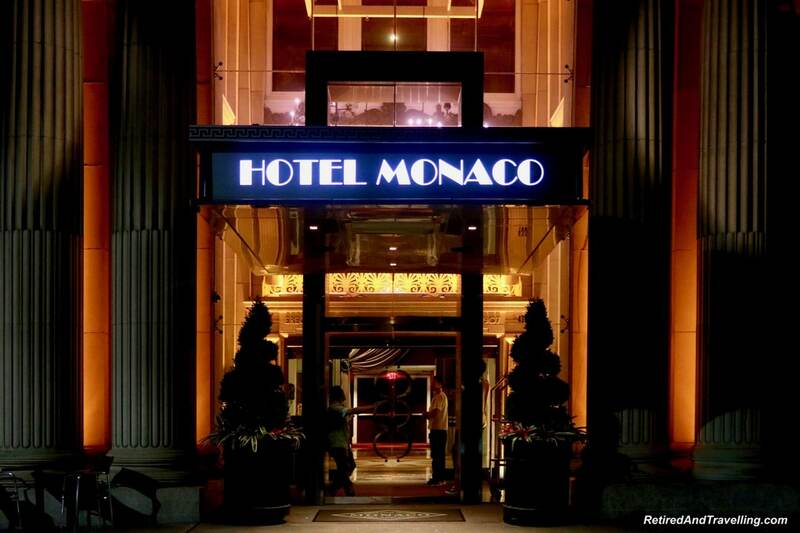 The Hotel Monaco looks so elegant with spectacular views. The museum is another place which had my attention riveted.Love the amazing street art too. I have never been to the United States but I promised my mom I’d visit her and when I do, I have to be there during the 4th of July! She has gone around the country but not in Philadelphia so I would show her this post so we can maybe visit together! Great post! I love that you shared some different things than just the historical sites (although, they rightly deserve to be on the list, like you did). 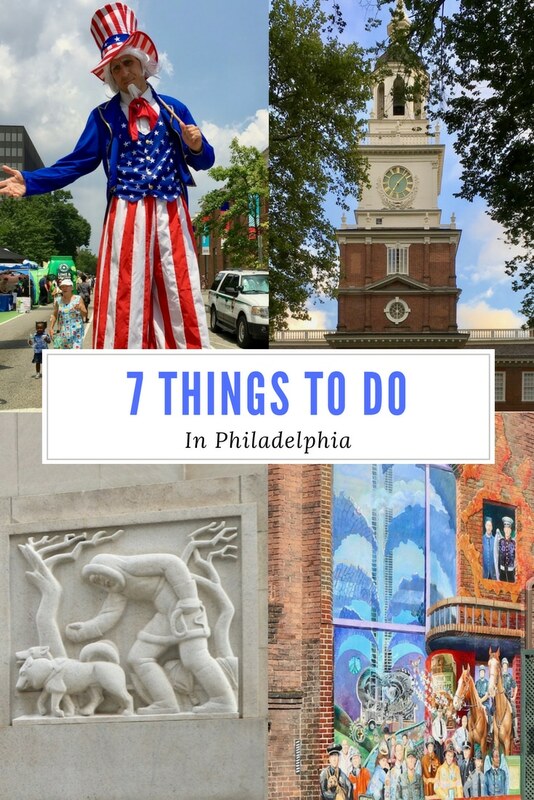 I’ve only been to Philly once, but I’d really love to see the street art – I’m a huge fan of checking that out in each city and it either wasn’t as prevalent 5 years ago or I totally had blinders on.